These substantial and modern structures have endless capabilites for creating a high-end visual experience. Customize to meet your media, product display and messaging needs with inventive add-ons. 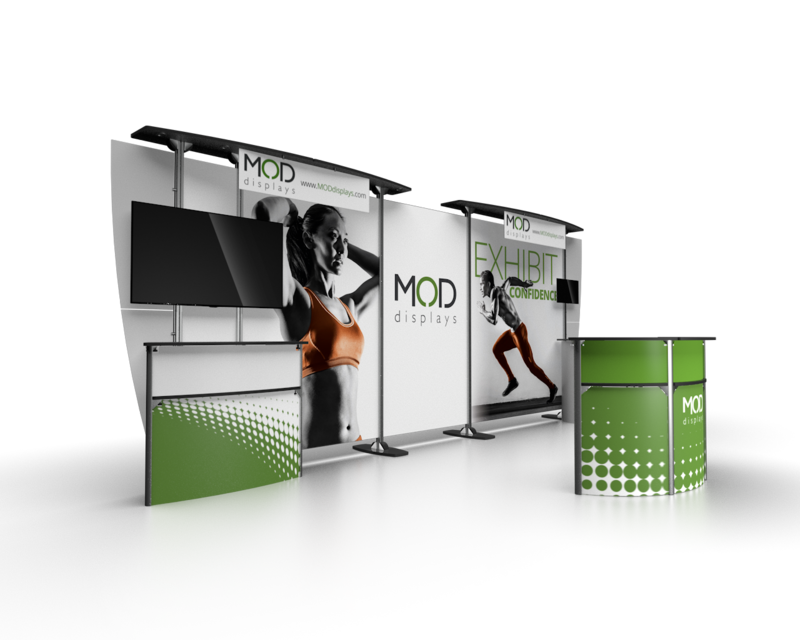 Two Exhibitline displays combine to form the back wall featuring a large monitor mount and a custom printed pedestal. Price includes two kiosk workstations with built-in monitor mounts and a cafe table with chairs. Kit ships in seven hard shipping cases with wheels that are included. 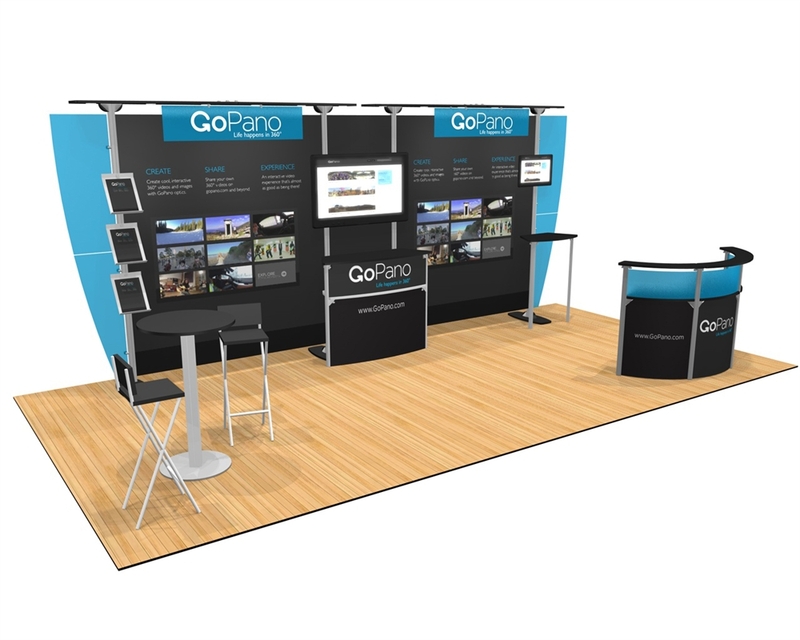 Two Exhibitline displays combine to form the back wall featuring three monitor mounts positioned above enclosed counters. 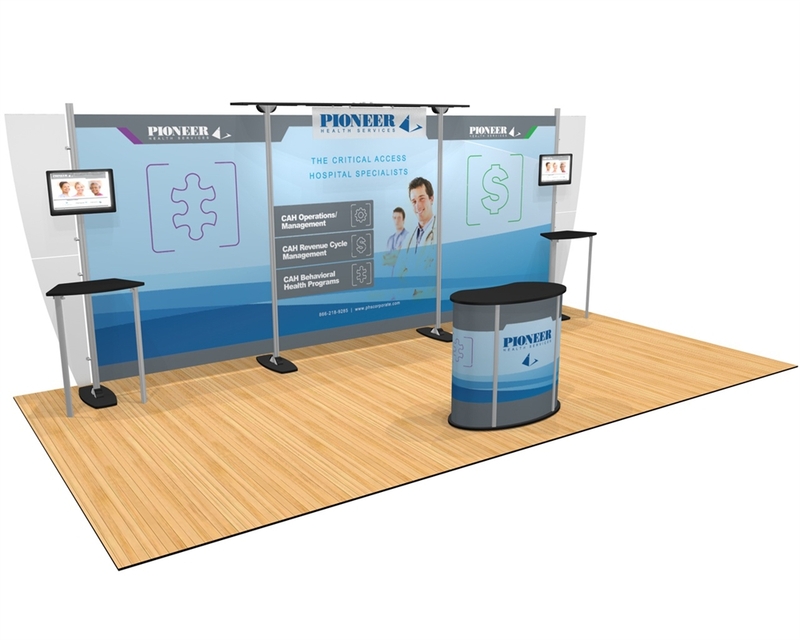 Price includes a custom printed counter and a workstation kiosk with a monitor mount. Kit ships in five hard cases with wheels that are included. 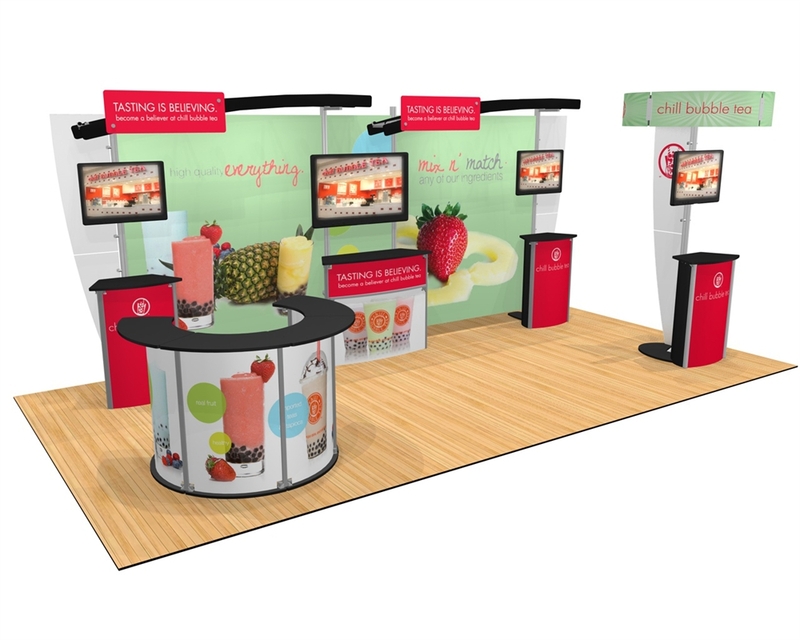 Two Exhibitline displays combine to form the back wall featuring two monitor mounts positioned above enclosed counters and built-in product shelves. Price includes two light boxes with it in literature shelves and a reception desk. Kit ships in five hard shipping cases with wheels that are included. 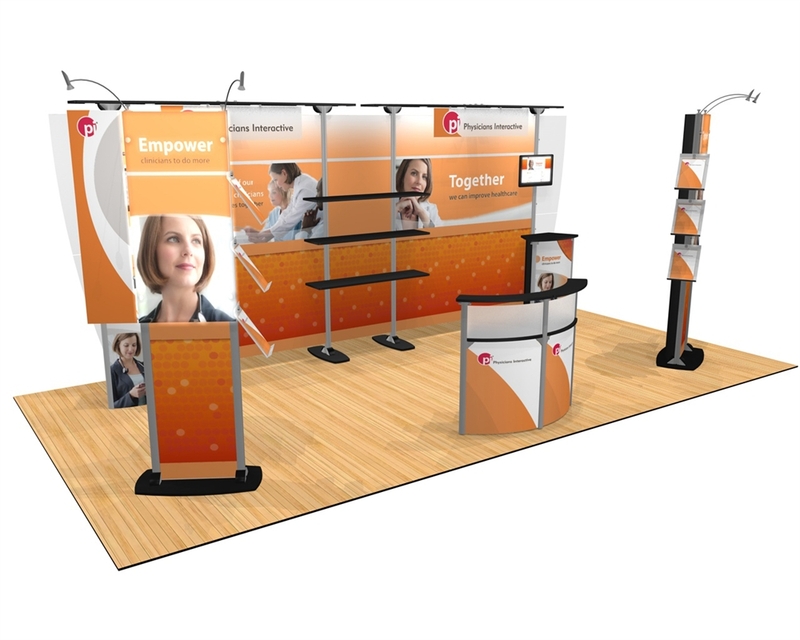 Two Exhibitline displays combine to form the back wall featuring two monitor mounts positioned above enclosed counters and built-in literature shelves. Price includes a reception counter and a workspace with a custom printed wall and cafe table with chairs. Kit ships with six hard shipping cases with wheels that are included. 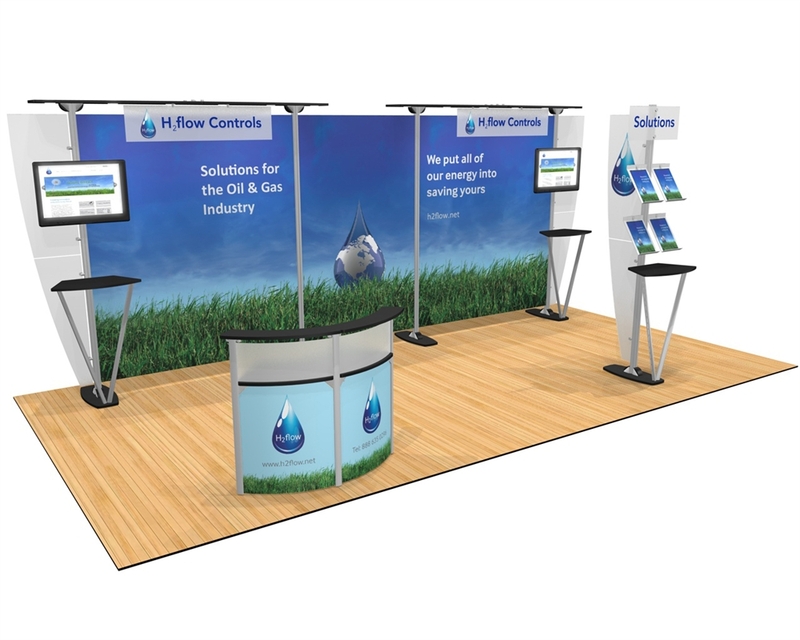 Two Exhibitline displays combine to form the back wall featuring three monitor mounts above custom printed counters. Price includes a freestanding custom printed counter, and a cafe table and chairs. Kit ships in five hard shipping cases with wheels which are included. 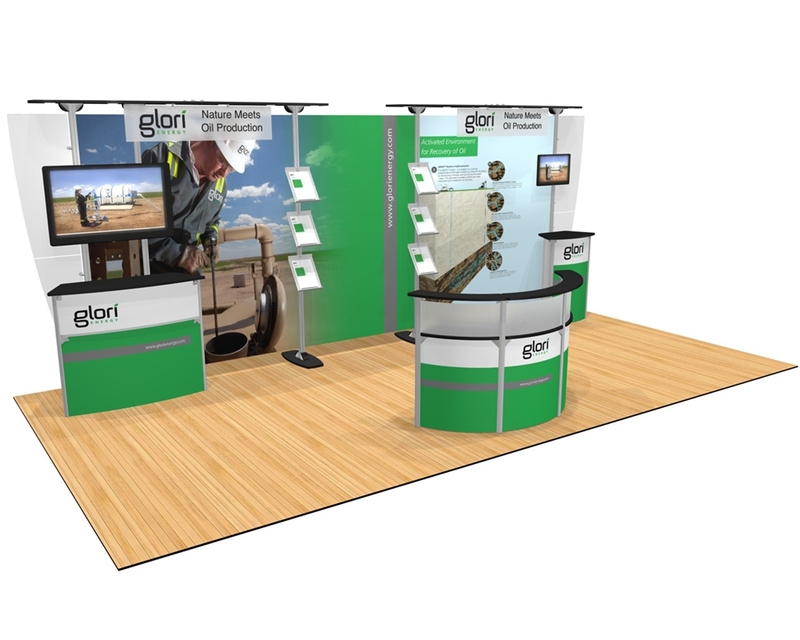 Two Exhibitline displays combine to form the back wall featuring two monitor mounts and a built-in enclosed counter. Price includes a custom-printed locking counter, a kiosk workstation with monitor mount and a cafe table with chairs. Kit ships in five hard cases with wheels that are included. 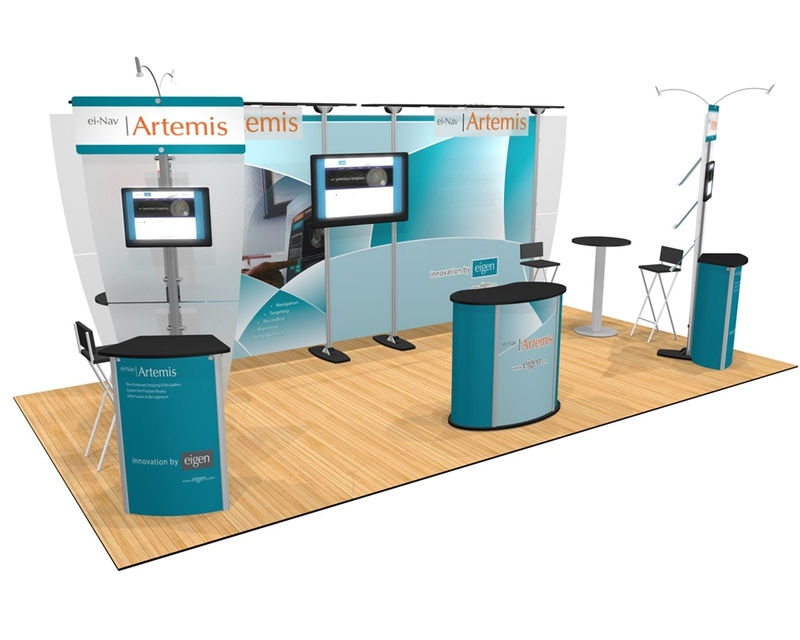 Two Exhibitline displays combine to form the back wall featuring two monitor mounts positioned above enclosed counters. Price includes built-in literature shelves and a custom printed reception desk. Kit ships in four hard cases with wheels. Two Exhibitline displays combine to form the back wall featuring two built in monitor mounts, literature shelves and counters. Price includes custom printed freestanding counter and a cafe table with chairs. Kit ships in five hard shipping cases that are included. 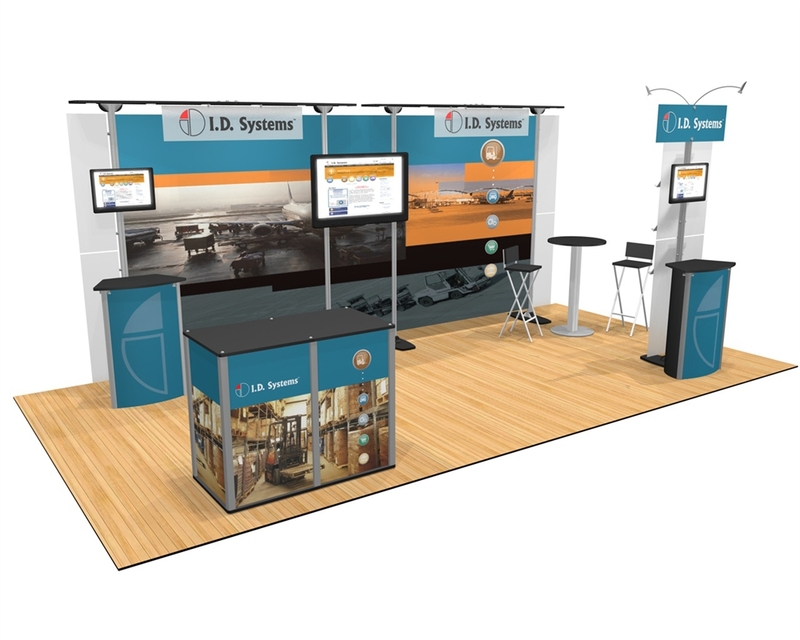 Two Exhibitline displays combine to form the back wall featuring two monitor mounts positioned above v-leg counters. Price includes a custom printed reception desk and a kiosk with built-in literature shelves. Kit ships in four hard cases with wheels that are included. Two large graphics are added to this standard Exihibitline display to form the back wall featuring two monitor mounts above straight leg counters. Price includes a custom printed pedestal and three hard shipping cases with wheels. A great investment for a growing company with plans to elevate their image. 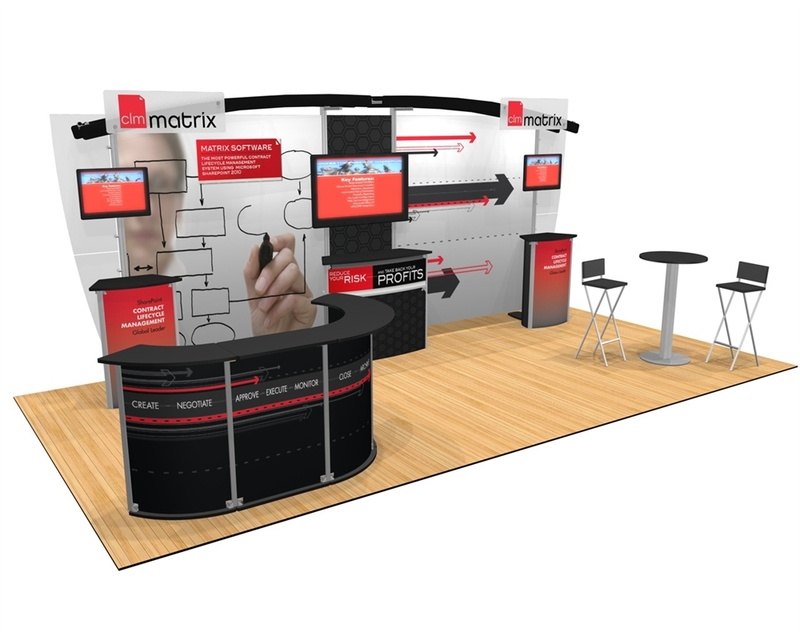 These modular displays create a sophisticated, high-end visual experience. Multiple custom-printed panels, built-in lighting, customizeable accesories, media-mount support, and easily scaleable system. No tools necessary for setup. 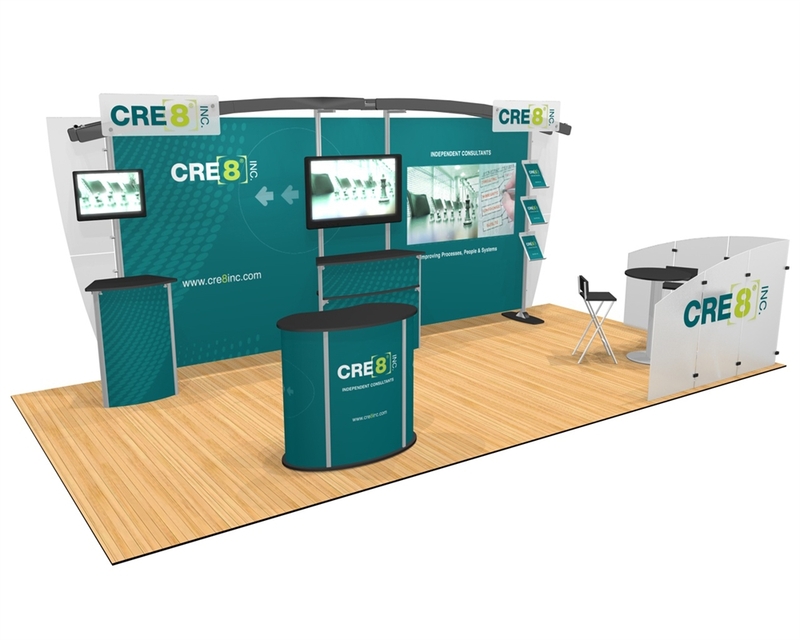 The 10' x 20' trade show booth display kits include a variety of counters, pedestals, monitor mounts, table and chairs, and more. We can customize or combine a configuration based on your company's needs. Entire display system packs down into flat, shippable hard cases.